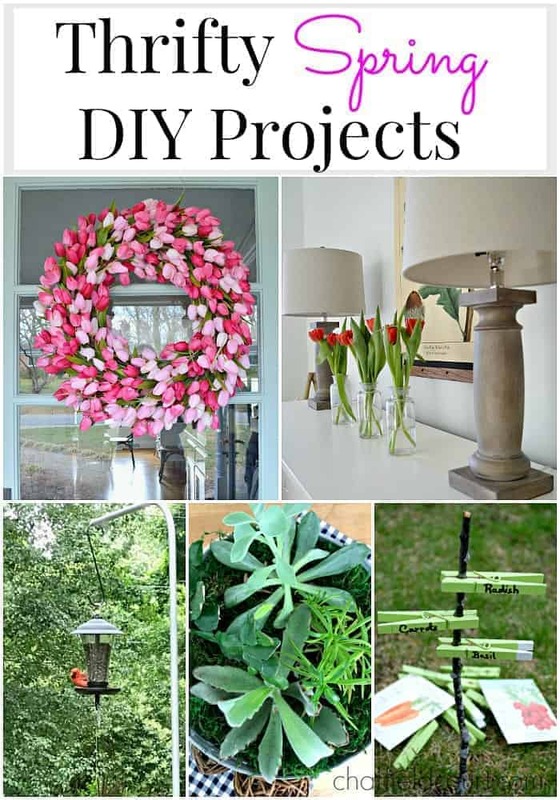 Let’s get ready for spring with some easy and thrifty DIY projects. I don’t know about you but I’m so ready for Spring. We had a bit of a teaser this week with several days of warm weather so now I’m really ready to pack up winter and start my Spring decorating. In case you need a little nudge, I’ve put together some of my favorite thrifty DIY projects to help you on your way. 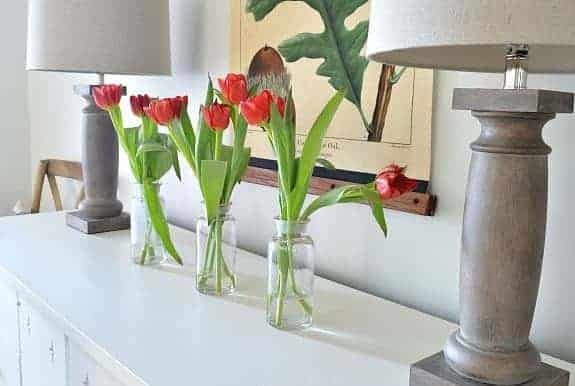 Get your home ready for Spring with these easy thrifty DIY projects. Everything from front door wreaths to a simple but beautiful Spring centerpiece. 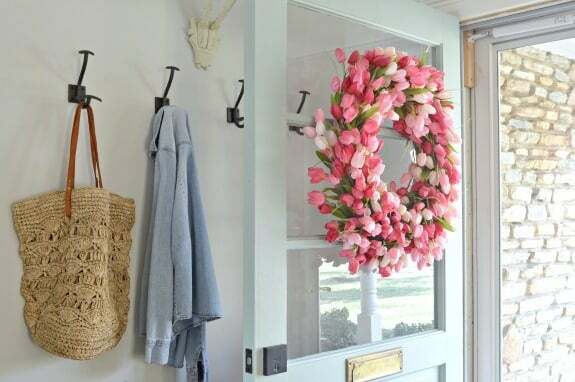 An easy Spring wreath for your front door with lots of pink tulips, ribbon and a simple wreath form. A beautiful welcome for visitors. 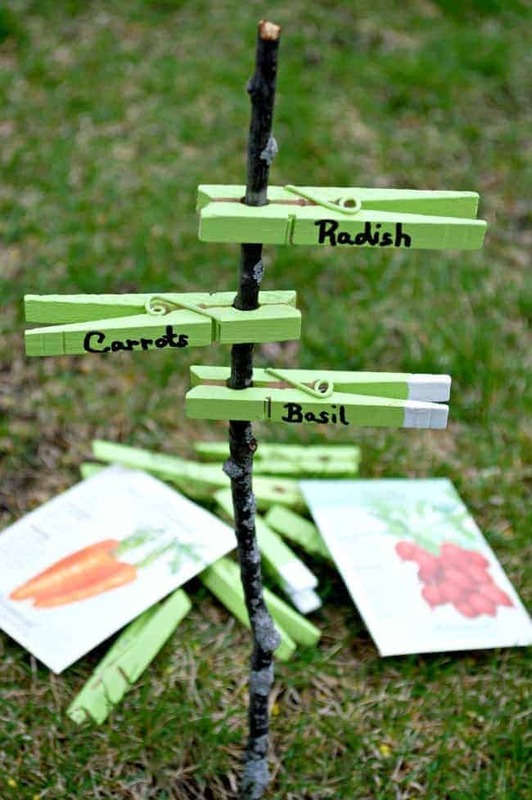 Check out my super simple, and inexpensive garden markers using clothes pins and sticks. A fun craft project for kids! 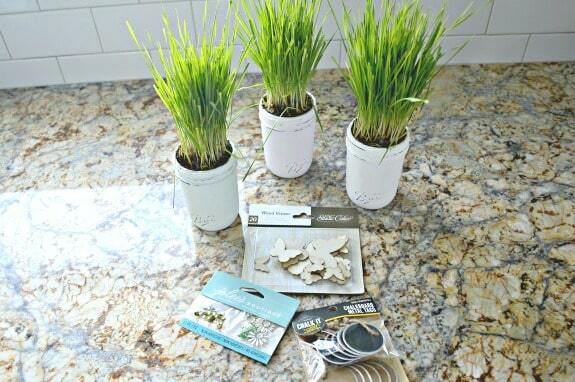 Easy DIY chalk paint Mason jar planters to brighten up your windowsill. A fun craft for kids! 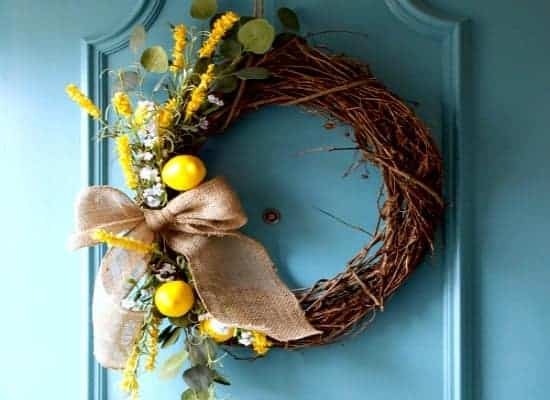 How to create this sunny DIY Spring wreath for your front door with just a few supplies. So easy to put together! 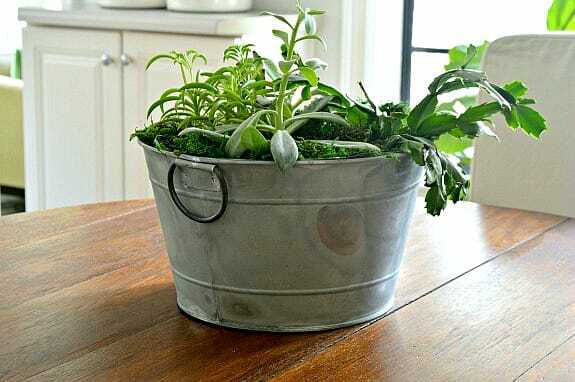 Create this simple DIY succulent planter using your favorite succulents and an old (or new to look old) galvanized bucket. Perfect for your Spring table. 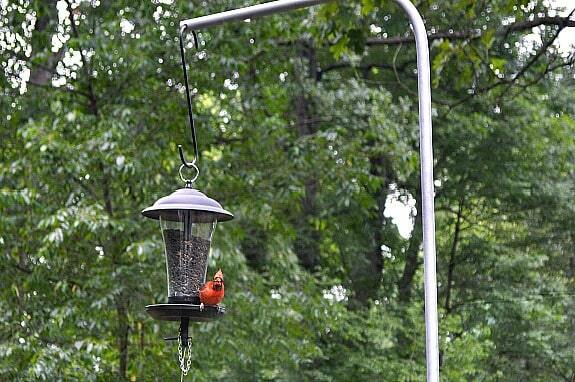 A DIY bird feeder pole for under $5? Absolutely! See how I made this simple bird feeder pole that you can put anywhere in your yard. So easy to do! 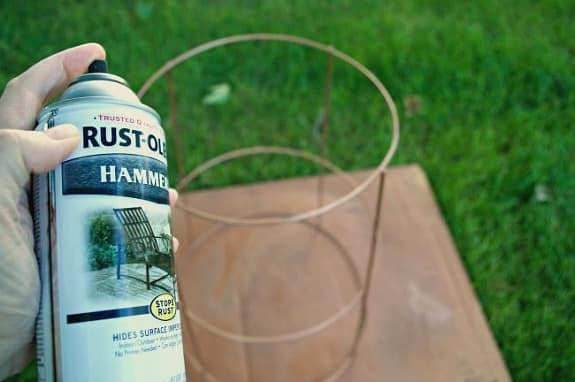 How to make this quick and easy DIY plant stand from a tomato cage. An easy Spring front door basket with faux forsythia and a woven basket. 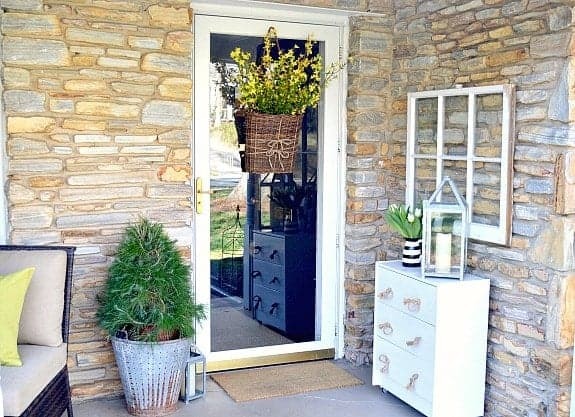 A pretty Spring addition to your front door. Using thrifted vintage jars to create a simple but pretty Spring centerpiece. What about you? Have you started decorating for Spring yet? So many beautiful spring ideas, the wreath is absolutely gorgeous! Don't subscribe All Replies to my comments Keep the conversation going! Subscribe to comment replies via e-mail. You can also subscribe without commenting.